In November, Andrea Petro stepped down as executive vice president and division head of Wells Fargo Capital Finance’s Lender Finance Group — a niche lending product she created and developed more than 20 years ago. As she prepares to move on to the next phase of her life, Petro spoke with ABF Journal editor Nadine Bonner, touching on the highlights of her career and recalling how she thrived on the challenge of being a woman in a man’s business world. As a teenager, Andrea Petro learned a secret that many people in business never learn — the key to customer service. She started her career as a waitress at the iconic Howard Johnson’s restaurant. She was only 16 but already a shrewd observer of the human condition. asset-based finance divisions in the country. This accomplishment is even more remarkable when you consider that she launched the lender finance group at a time when women were practically invisible in the asset-based lending industry. Petro never expected to have a career helping lenders obtain financing through asset-based loans any more than she expected to remain a waitress. As a student at Kent State University, she studied Russian language and literature and Soviet studies. Petro was a true scholar, immersed in history, literature and geography. After graduation, Petro did not flounder for long. She enrolled in the University of Texas at Austin to acquire an MBA and a path to a real career. The now-pragmatic student saw that most of the jobs available at the time were in either banking or accounting. While still in school, she got a taste of accounting when she took a job as a bookkeeper. It did not fill her with a desire for more. With her MBA in hand, Petro went to work for First City National Bank of Houston. Like most banking recruits in the 1980s, she was placed in a training program and spent 18 months learning different aspects of the bank. Eventually she landed in commercial lending, where she managed several transactions that involved asset-based lending, a concept she had never encountered before that appealed to her pragmatic nature. “Basically, the bank training program never explained cash-flow lending. My question was always, ‘How do you get paid back?’ There never seemed to be an intellectually satisfying answer to that question. Obviously, you know how you’re going to get paid in asset-based lending,” she says. In 1985, First City’s asset-based lending subsidiary recruited her. It was a completely different corporate entity within the bank and issued commercial paper to finance the loans. And there she truly found her calling. Petro moved to Transamerica in 1992, which had a newlyestablished ABL division. At Transamerica she developed her signature product — asset-based lending to finance companies. While most banks have a lender finance division now, at the time it was unheard of, and Petro was free to use her creativity to develop it. “We experimented with the concept and were very successful,” she recalls. But in 2000, Transamerica was sold to GE Capital, which had no interest in lender finance. Petro knew she had a concept that worked and developed a business plan that found its way to Foothills Capital, a subsidiary of Wells Fargo. While it was rare at the time for a woman to lead a division, Petro had an advantage. “Literally, throughout the industry, no one had any experience lending to this niche,” she says. She also had a potential team lined up — people she had worked with at Transamerica who had already demonstrated that they could develop this product in a profitable way. Most of the team was drawn from the group at Transamerica, but shared core values and goals aligned all team members. This commonality, Petro explains, was the key to creating a highly functioning team that has been successful for 17 years. Being a woman in a man’s world was a challenge, she acknowledges, but managers at Wells Fargo strongly supported her, and by pushing herself to meet challenges, she became a better professional. Petro also credits her increasing involvement with the Commercial Finance Association with helping to launch lender finance at Wells Fargo and sharpening her professional skills. Petro says she has been involved with CFA “from day one.” When she first started out in ABL, her employer was very supportive of her participation in the CFA since the organization offered both education and networking opportunities. 25 young professionals in the class. My team at First City sent me to the program that was held two weeks in the summer for three years. We were taught by the top tenured professors and had courses in economics and capital markets that broadened our view of the world. There were also ABL case studies taught by ABL senior executives. It was a career enriching experience for me,” she says. The program enabled her to network not only with the other professionals in the program, but with the top leaders in the ABL business who were teaching the classes. “We established personal relationships that lasted a lifetime, that laid the foundation for profitable business partnerships,” she adds. Petro went on to serve as president of the CFA from October 2016 to September 2017. 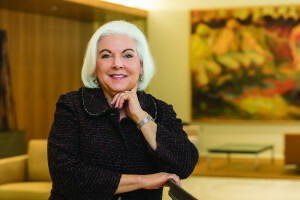 As past president, she remains on the organization’s executive committee and, even in retirement, she plans to remain active in the organization. “Whenever you interact with the CFA, you learn something,” she says. Petro considers the team she built at Wells Fargo and the creation and development of the lender finance niche to be her greatest professional experiences and accomplishments. Looking ahead, Petro is contemplating different paths, none of which include a return to Russian literature. “I think all of the paths will converge in some way to continue to be involved in the asset-based lending industry,” she says.